Automated Tasks often run without direct supervision. It does not mean, however, that the user should be ignorant about what is happening in the system. Log Manager keeps track of everything and shows information on past events in easy accessible format. 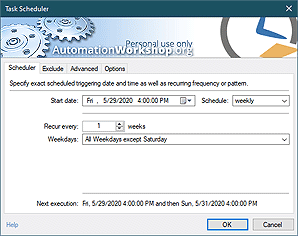 Log Manager shows executed Tasks and automation events in chronological order. User may choose to see events that have occured in particular period of time. Sorting option allows grouping events by Task, event description or event ID. With a single click it is possible to filter Tasks that have failed with error or encountered warning during execution, thus enabling easy troubleshooting in case of unexpected problems. 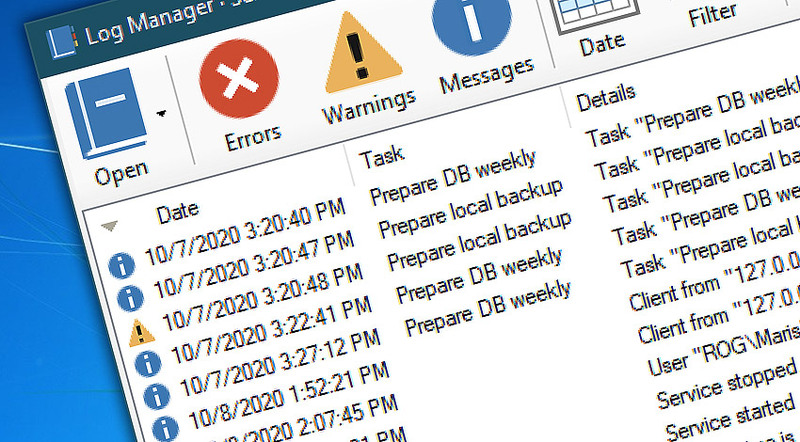 Task execution logs can be exported to file for future reference or processing in 3rd party software. Log manager is designed for comprehensive overview and effective data export. Log Manager gives user an overview on all past events in Automation Workshop. Error, Warning, Message filter allows to quickly locate the type of event you are looking for. Date filter to see events in particular period of time. Custom filter for viewing only specific log data when necessary. Sortable columns to group items by time, Task, description or event ID. Export feature allows to save past events in CSV file. Log Manager · shows the information on past automated events. Toolbar · filter events by their type, date and name. Log pane · shows the information on executed Tasks. Status bar · see and export event data. Events overview · see the list of logged events for all Actions.